This is one of my absolute favorite jam flavors. Top five, for sure. If you want to think about something other than citrus for a minute, make this! It absolutely explodes with the flavor of ripe, sweet, juicy pears. 4 c. ripe pears, peeled, cored, and diced (It only works when you find good pears- make sure the pears taste how you want the jam to taste; if they are grainy, too tart, or not ripe yet, don’t buy them. I used Red D’Anjou pears from a local farm, which were in season here. I’ve used Comice Pears in the past and they were also delicious). 3 tsp. Pomona’s Pectin Powder (I used commercial pectin to shorten the cooking time and retain the intense pear flavor). 1. Bring boiling water canner to a boil. Wash jars and lids in hot, soapy water. Put lids in a small bowl and cover with some boiling water from the canner. Put jars in the oven on low so they are hot when you put hot jam into them later. In a small bowl, whisk the 4 tsp. of pectin powder with 1/2 c. sugar and set aside. 2. In a large, non-reactive pot, combine pears, lemon juice, cardamom, calcium water, and 1 1/2. cups of sugar. On medium-high heat, bring to a full rolling boil. Pour in the pectin/sugar mixture, and bring back to a full rolling boil. Boil for 1 minute, stirring occasionally. 3. Ladle hot jam into hot jars. Wipe the jar rims clean, and screw on the lids. Process half-pint jars for 10 minutes to get a good seal. This is a strong candidate for The Jar That Actually Goes On Toast In The Morning…. but if you don’t want to go that route, don’t forget how delicious pears are with almonds- there are all kinds of tart and cookie possibilities here! This is also one of the jams that I serve on a chevre-ginger cheesecake that I make really often- I would highly suggest the idea of any type of cheesecake with this jam on top. my friend christopher and i are going to attempt both pear jams this weekend, but can you tell me what calcium water is and if there’s a substitute? i found the pomona’s pectin powder at whole foods, but not the other. Hi! I hope your jam turns out great- the Pomona’s calcium water is actually included in the pectin box. You’ll see two packets, and one is the pectin powder, and the other is powdered calcium. There will be instructions inside the box for how to mix it with water to make calcium water. Good luck! well, we had some issues with the pomona’s pectin and multi-tasking (making two batches of different jams at the same time). am wondering if you could use liquid pectin instead for our next foray. the jam’s flavor is great, but the consistency was a little too firmly gelatinous. thank you! ok, one more question — can we double the recipe? 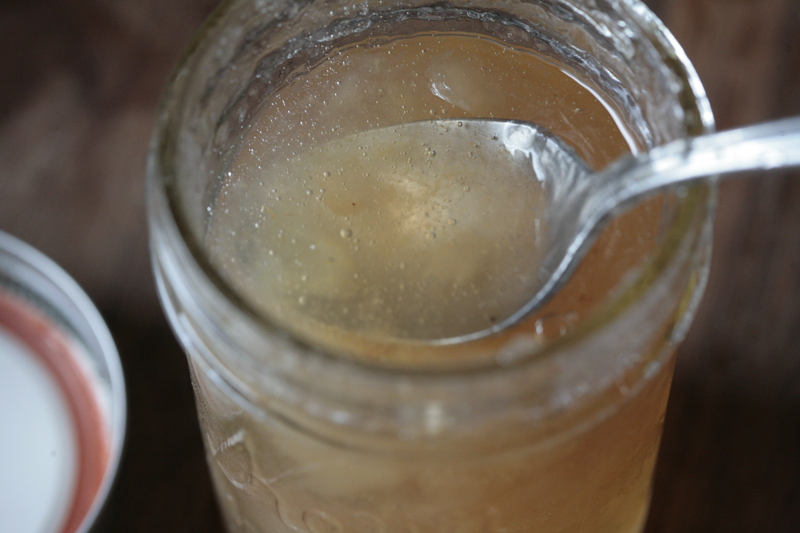 some people say it messes up the thickening aspect of the pectin — what do you think/say about that? thanks again. everyone said the flavor on this is spectacular! Those people that said not to double it were right 🙂 If you’re using commercial pectin, it doesn’t thicken right, and if you’re making jam with no added pectin, it just makes it takes forever and a day. I always make multiple small batched. Glad you’re getting complements on the flavor! Are you trying a different brand of pectin this time? okay, glad i asked. yes, we used the liquid pectin which was so simple and the jam came out great. i made two different batches — pear vanilla and cranberry, orange, raspberry & ginger jam! and melting down the cardamom that had set too firmly worked. christopher heated some up and poured it over cut up pears, fresh blueberries and some homemade granola for a sorta “brown betty” type dessert and said it was wonderful. will be trying your recipe again this weekend. I haven’t had this much fun in years — thank you! I just made this using the amount of POmona’s you call for and found it set up too much. I am going to try it again tomorrow using the rest of my pears but decreasing the Pomona’s by 1 teaspoon of the calcium water and 1 teaspoon of the pectin. Pears have natural pectin in them so I am thinking the amounts you used are a touch too much. That’s a bummer that it came out too firm. I’ve actually been working on a new version of this recipe without any pectin at all (different brands/fruits can be too inconsistent for my liking). Come back and let me know how the reduced pectin version works, I’ll add a note on the recipe so other folks can see your results. Okay I just made another batch. Well a triple batch actually since I had a lot of pears. And I figured out why it is turning out so hard for people. I looked at the recipe cards from Pomona’s for pear jam and used their measurements. You reversed the pectin and calcium water amounts. It should be 4 teaspoons of calcium water and 3 teaspoons of pectin per 4 cups. A triple batch gave me exactly 12 8-ounce jars. And they were starting to set up nicely as the jam cooled while I was lading it into the jars. The first time I made it I got exactly 4 jars. So it works out to 1 cup of fruit per jar. And I decided to slightly mash the pears after they had cooked for a little bit before bringing them to a boil. That seems to be perfect for texture purposes. Thanks knit, I fixed it up in the top recipe. I’m not sure how that could have gotten flip-flopped, but I see that you’re right. How lovely that you had so many pears, your pantry must look beautiful right now! The pantry would be lovely if I would ever spend an hour straightening it up. All of the gift jars are out of there so I need to spend time rearranging it this weekend. I still have a butternut squash to pressure can. But the pears are heavenly!